WIFI and Android are a fantastic combination. Even with a 4G phone like the Samsung Epic 4G, WIFI is a much more dependable connection. Unfortunately, leaving your WIFI turned on all the time can be a drain on your cell phone’s battery. And, who remembers to turn it off? It’s so much easier to turn WIFI on and off automatically. You could use GPS to determine your location and automate WIFI state but that would force your phone to trigger GPS which is an even worse drain on your battery. Instead of using GPS, I use my local Cell Phone Towers to determine my location. Since your cell phone always keeps track of the surrounding cell towers, there is no additional battery drain … just battery savings! 1. Creating a new Task based on State of Cell Near. Tasker by Crafty Apps is very powerful and feature rich. Basically, Tasker can control almost any function and application in Android. Start by clicking a New task (with name “work – Cell Near”), then select State and finally Cell Near. 2. You will need to find the Cell Phone Tower near your location. In the Cell Near state, there is a button below the text box labeled Scan. 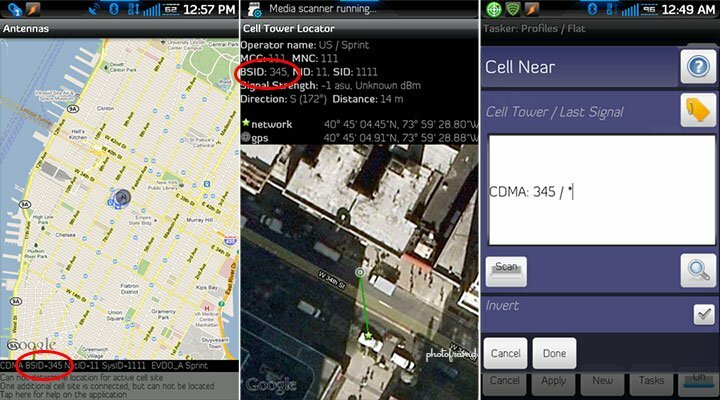 Click Scan and Tasker will display the surrounding Cell Towers. Tasker will also include a number indicating the Last Signal. Since that can vary, I replaced the number with an asterick wild card. It’s very important to verify that you are using the correct Cell Tower as the trigger for this Task. There are two free Apps in the Android Market which provide the BSID number. Download Antennas by mpoly and Cell Tower Locator by TechMind. Click New Task to start. You will not need to give the task a name. Click the plus sign to continue with the Action. 4. Select a Net Action of WIFI. In the Action Category, click the Net button and then the WIFI button. In the WIFI dialog box, Set the WIFI to On and then click Done. 5. Clone the completed Task to quickly create a new Task to Turn WIFI Off. Click Done again to complete the first Task. You just completed a Task to turn WIFI on. But, you will also need a Task to turn WIFI off to fully automate the process. 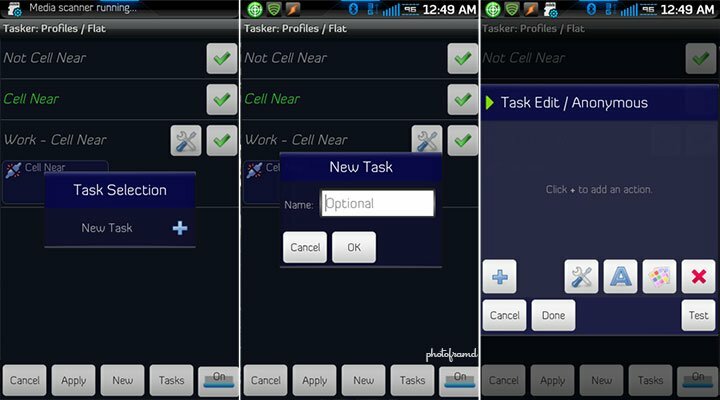 Click the Wrench icon in the Work – Cell Near Task and then select Clone. 6. Edit the settings of the Cloned Task. 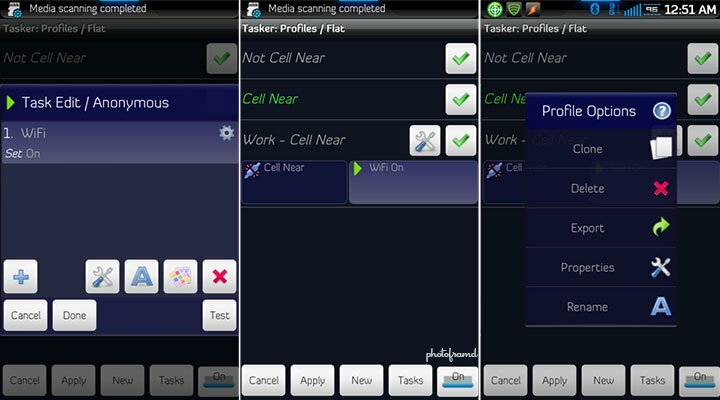 Click the Cell Near button in the cloned Task, check the checkbox to Invert the selection (creating a Task for when you are not near the specified Cell Tower) and click Done. Then, click the WIFI On button and changed the Set to Off and click Done. You can now click the Wrench icon again to rename the Task “Work – Not Cell Near” to clearly identify this Task. You have now completed your Task pair to automatically turn WIFI on and off using the Cell Tower location as the trigger. You can create additional pairs for every instance where you use WIFI (ex. home, public hotspot, etc.) When a Task is active, you will see it turn Green. Tasker will also display an icon in your status bar and list active Tasks in your Android Notifications. 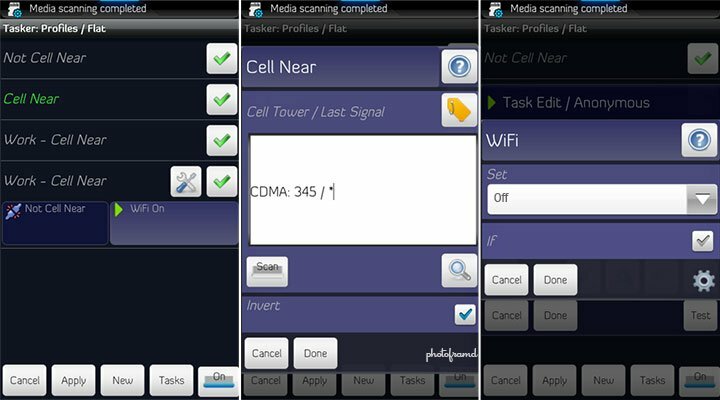 Tasker is a very powerful tool to automate tasks on your Android phone/tablet. But, it can also be very complex. 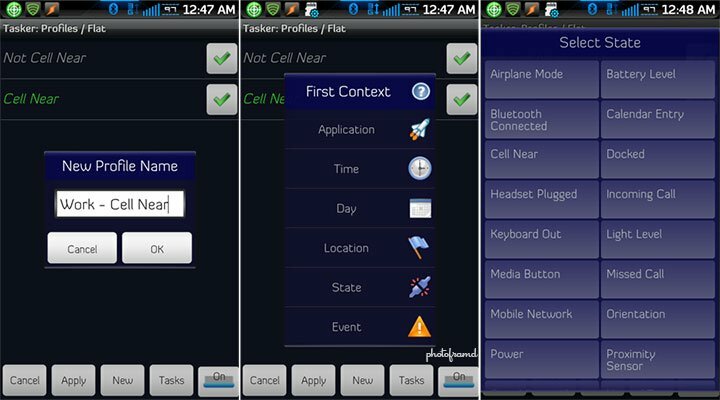 You can find additional information on Tasker’s Wiki as well as various Android Forums. What do you do when you are bouncing between 3 towers in your home? It seems that it will be switching wifi on and off every few seconds. ?? Thanks. Did you try adding all three towers? It should work. Might even be able to use and OR in-between them.